Type 1 diabetes: Mental stress can increase or decrease blood sugar levels. Type 2 diabetes: Mental stress generally increases blood sugar levels. Use your diabetes logbook to discover if mental stress affects your blood sugar levels, especially if you have type 2 diabetes. Some people with type 2 diabetes are very sensitive to stress. It causes the body to produce especially high levels of stress hormones, which drive blood sugar levels up. Rate your stress level on a scale of 1 to 10, where 1 indicates the lowest stress level and 10 the highest; record your stress level in your logbook. Test your glucose using your home monitor and enter the result. After a week or two, study your results to see if there is a pattern or relationship between your stress level and your blood sugar levels. Teach yourself to relax when under stress using deep-breathing exercises or techniques you learn in a stress-management class. Evaluate your schedule and determine if you can make changes to relieve stress. 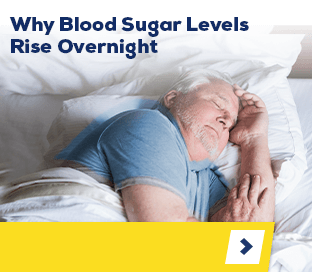 Glucerna is the #1 Doctor Recommended nutritional shake for people with diabetes, and contains CARBSTEADY®, which includes low glycemic carbohydrates formulated to help minimize blood sugar spikes as part of a diabetes management plan. Try one today!